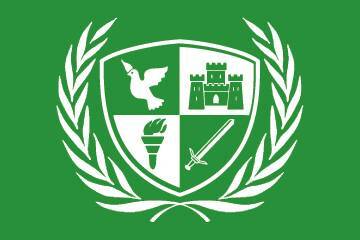 The Green Protection Agency (GPA) hereby affirms the full sovereignty of the GPA. The GPA proclaims its sovereignty in the name of free development and the prosperity of its members, ensuring the rights and freedoms granted to members by the GPA Charter and laws. The inalienable rights of the GPA as a sovereign alliance shall be realized, including its rights to self-defense, self-determination, and the supremacy of its members in directing the GPA's course. Membership in the GPA shall be an integral part of its sovereignty. The GPA shall protect the rights and interests of its member nations. Conferring and terminating GPA membership shall be the sole right of the GPA, in accordance with its own laws and standards. Claiming membership in the GPA shall be the sole right of those nations to whom the GPA has granted membership. Claims of membership shall cease immediately upon termination of membership by the GPA. The GPA flag, name, seals, intellectual property and emblems (hereafter collectively referred to as 'identity items') shall remain the exclusive property of the GPA. GPA identity items shall only be used with the expressed consent of the GPA, as authorized by the GPA Charter, DoN, laws and government. The citizens, territories, and properties of the GPA are inviolable. Territories and properties of the GPA or its member states include, but are not limited to: GPA identity items, GPA moderated forums and websites, GPA internal documents, and GPA-approved aid packages. The GPA shall independently exercise the right to enter into, or withdraw from, voluntary unions, pacts, and treaties with other alliances. Any person, nation, or alliance that contravenes, undermines or attempts to contravene or undermine the terms of this declaration, is in violation the GPA's sovereignty. Persons or nations who spy on the GPA (in game or through OOC means), or share protected information without permission, have violated the GPA's sovereignty. Such perpetrators have committed a 'hostile action' against the GPA. Hostile action is defined as an actual, attempted, or threatened attack, invasion, or endeavor to inflict harm upon the GPA or its citizens, territories, or properties. Subject to the GPA’s Charter, DoN and governmental discretion, the GPA reserves the right to retaliate against any perpetrator who violates the GPA's sovereignty by any and all means necessary. Punishments may include, but are not necessarily limited to: restitution and/or military action.